This week’s Friday Field Foto is not really of the field … but it was in the field … ON THE MOON! I was in Florida a few weeks back for short vacation and family reunion and we spent a day at the Kennedy Space Center checking out space shuttle exhibits and Apollo program exhibits. One of the best parts of the entire place was a room full of gear and equipment that was on the moon. 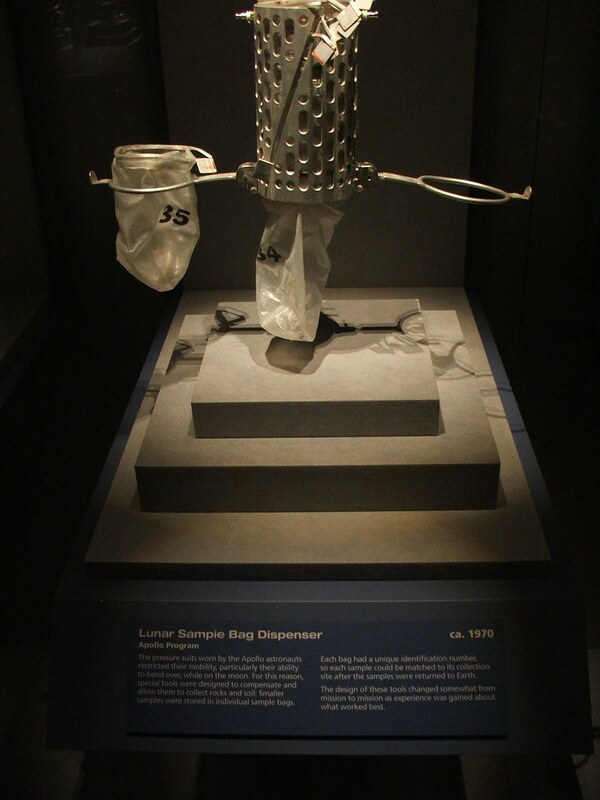 While most of my family was looking at the space suits with moon dust still on them, my wife and I were checking out the super cool sample bag dispenser. The pressure suits worn by the Apollo astronauts restricted their mobility, particularly their ability to bend over, while on the moon. For this reason, special tools were designed to compensate and allow them to collect rocks and soil. Smaller samples were stored in individual sample bags. Each bag had a unique identification number, so each sample could be matched to its collection site after the samples were returned to Earth. The design of these tools changed somewhat from mission to mission as experience was gained about what worked best.